For two weeks, we have had air so bad going outside was dangerous to your health. Consistently over 150 on the air quality health scale, with a high of 296 in our area, if you went outside, you started feeling sick, coughing, screwed up your lungs. It was offshore winds for two weeks, blowing the campfire fire smoke over the bay area, a rarity in itself this time of year, much less combined with horrible 150,000 acre fires. It's FINALLY raining today, clearing the air. We really do have a big reason to give thanks this year. 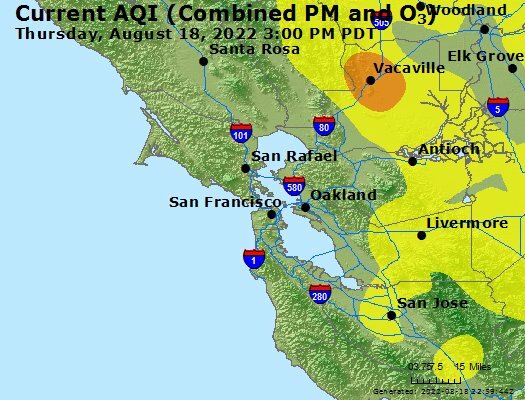 It's still moderately bad in the SF bay area and beyond. And rain in the areas that had major fires could cause dangerous mud slides, a double disaster. Now we have really heavy rain. . Two feet deep on highway 580 just off the bridge tonight. Closed the right lane, unless 4wd or suv. Did not require snorkels, except your air intake better be on the high side. This just sounds horrible. And all this was caused by an errant camp fire? People need to make sure their fires are completely out before leaving their camp site. Not a campfire, the Camp Fire. Bad name choice by authorities. Most likely cause is electric utility line fault of some type. Most destructive fire in state history. At the same time, due to dry conditions, and tons of growth from the most rain in one year in recorded history, we had a number of other fires, one about 25 miles away, Niles Canyon, that added to the polution. Meanwhile, Socal has had a bunch of fires as well. This was all fueled by strange offshore winds that continued for an unusual, 2-3 week period. Due to the high growth rates in the trees last year, coupled with a long drought that has put trees root systems at risk, you have a lot of top heavy trees likely to fall onto power lines. Which is probably known to locals familiar with the area but everyone I talked to about this assumed it was started by a camp fire. Awful choice of name by the authorities. "Camp Creek Road Fire", or even "Camp Creek Fire", probably would have been better choices. Name aside, the images here really tell it all. We were at 296 in Oakland in the peak of the smoke. Having spent 14 years in Berkeley and Albany in a previous millennium, I recall that the residential heating equipment was sometimes inadequate to handle outdoor temperatures close to freezing. Bring out the clothing layers normally reserved for the Sierra Nevada range. That's where electric space heaters come in. Note that every area has this issue if temperatures get low enough. For example, the heating system in my house can't really hold a comfortable temperature when it gets into the single digits F or below. Fortunately, that rarely happens in NYC.